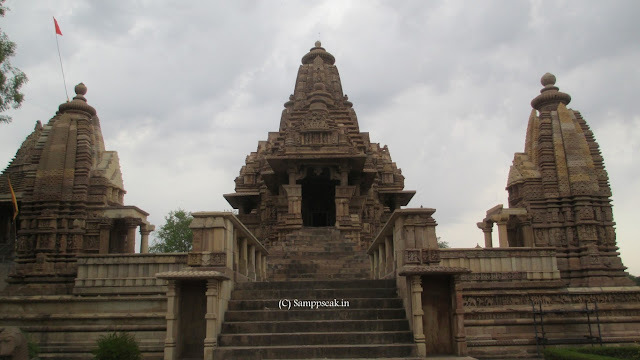 In June this year, I travelled by train to Bundelkhand and was awe-struck by the history and the monuments of Khajuraho temples famous for their nagara style architecture. Walking near the intricate structures, one’s memory wandered to the ancient kingdoms, the Great Maharajas, their passion for arts and culture and sadly the way, history and invaders wiped them. These temples were built by the Chandela dynasty ~ most famous among them being King Yashovarman. Our tainted history books do not have much to read on them is sad ! Bahubali (One with strong arms), a much revered figure among Jains was the son of Rishabha (first tirthankara and founder of Jainism). After the nonviolent duel with Bharata, his elder brother, Bahubali abandoned his kingdom and clothes to became a Jain monk. Bahubali is also called Gomadesh because of the statue dedicated to him. "Gommateshwara" statue, built by the Ganga dynasty is a 57-foot (17 m) monolith (statue carved from a single piece of rock) situated above a hill in Shravanabelagola, in the Hassan district of Karnataka. Prabhas powerful portrayal in SS Rajamouli directed film hit the movie industry by storm – a totally unexpected high grosser, though Bollywood would compare it with Bjarangi Bhaijaan, which by nature has a wider audience. According to some commentators, the films released a week away from each other, have together gave the industry over Rs 1200 croresin just two months. Baahubali opened to a huge Rs 50 crore at the domestic circuit and reached the Rs 250 croreclub in the domestic circuit alone. With a budget of around 250 crore, this was the highest ever in Indian cinema, the movie easily surpassed expectations raking in crores for its makers. There were reports that Rajamouli was mulling making a special international version of his magnum opus planning to release the movie in China. The movie is a fictional story of two warring brothers vying for control of an ancient Indian kingdom ‘Mahismati’ - : Prabhas & Rana Daggubati with Tamannaah, Anushka Shetty, Ramya Krishnan, Sathyaraj, Nassar, Tanikella Bharani and Sudeep in other roles. The Soundtrack and background score of Maragathamani Keeravani captivates so also is the cinematography and visual effects. The movie happens in the (fictional) ancient Kingdom of Mahishmati- the sequence starts with Sivagami, the queen mother (Ramya Krishnan), carrying a baby in her arms, emerges from a cave adjoining a big waterfall; is chased and kills the soldiers pursuing her and sacrifices herself to save the baby. Sanga (Rohini) and her husband name the infant ‘Shivudu’ and raise him as their own son. The child grows up aspiring to hike the waterfall, he makes several unsuccessful attempts much against his mother's wishes. With great efforts, he succeeds and atop, he finds newer World – one of a rebellious group to which Avanthika (Tamannaah), too is a dedicated fighter avowed to retrieve Queen Devasena [Anushka] from King Bhallala Deva (Rana Daggubati). Shiva undertakes the mission ~ succeeding against odds and beheads Bhallala deva’s son protected by royal guard Kattappa. The rivalry and animosity between cousins Amarendra Bahubali and Ballaladeva unfolds in the flashback. The cousins Bahubali and Bhallala grow up trained in all aspects fits to becoming a King – Bahubali always smarter, wiser and concerned for the subjects. A war is forced upon Mahismati as evil forces of Kalakeyas invade – and after the victory, Baahubali is anointed as King. The movie ends on a surprise note with revelation that it Kattappa who had killed King Amarendra Bahubali. In some interview, SS Ranamouli stated that he created the fictional kingdom of Mahismati, lying around a mountain and above waterfalls and for that he had extensively researched on 14th century kingdoms. From dressing to weapon design, language to romance, everything is fictional but yet looks like a fairytale– a web search has some interesting facts. The Avantis, the ancient people belonging to this realm were described as mahavala (very powerful) in the UdyogaParva oftheMahabharata. There reportedly are some more references in Puranas too. Avanti, was an ancient Indian janapada (realm), roughly corresponded to the present day Malwa region. According to the Buddhist text, the AnguttaraNikaya, the janapada was divided into two parts by the Vindhyas, the northern part had its capital at Ujjayini and the southern part had its centre at Mahishmati. By some accounts, the Haihayas were the earliest rulers of Avanti, who captured the region from the Nagas. Initially, they ruled from Mahishmati. The Haihayas were a confederation of five clans. KaarthaveeryaArjuna was the foremost ruler. Mahismati, the most important city in the southern part of the Avanti kingdom, which later served as the capital of the Anupa Kingdom, was located in present-day Madhya Pradesh, on the banks of Narmada River, although its exact location is uncertain. Several cities in Madhya Pradesh, located along the Narmada river, are claimed to be the ancient Mahishmati. These include:-Maheswar, Mandla, Mandhata…..the Kalachuris who are credited with famous cave temples of Elephanta island ruled from Mahismati. AdiShankaracharya is said to have defeated Mandana Mishra in a debate at Mahishmati. Mandana Mishra became disciple of AdiShankaracharya after the defeat. It is this name that is used as the land of fictional Kingdom for the film ‘ Baahubali’. Normally, your write ups are informative. Without such life saving info.how sir?